I often come home from the store and realize I forgot the very item that prompted me to go in the first place. Corn tostadas were one of my most recent forgotten items. Since I refuse to make a trip for one or two items, so began my efforts to make corn tortillas at home. 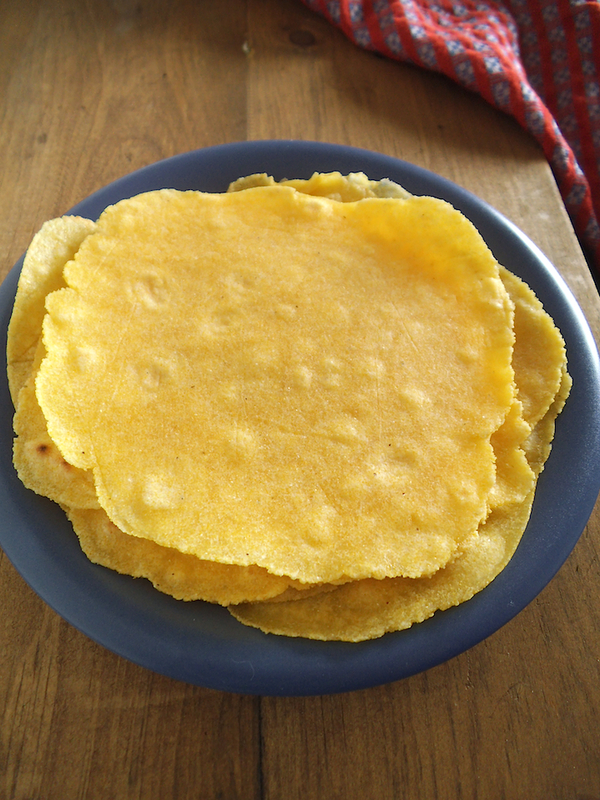 After I shared my recipe for Basic Flour Tortillas, I had the intention of trying homemade corn tortillas. Because the freshness of homemade tortillas absolutely cannot be beat. After a few misfires with masa harina flour in other recipes, I looked for a recipe that could use cornmeal instead. And I found two. 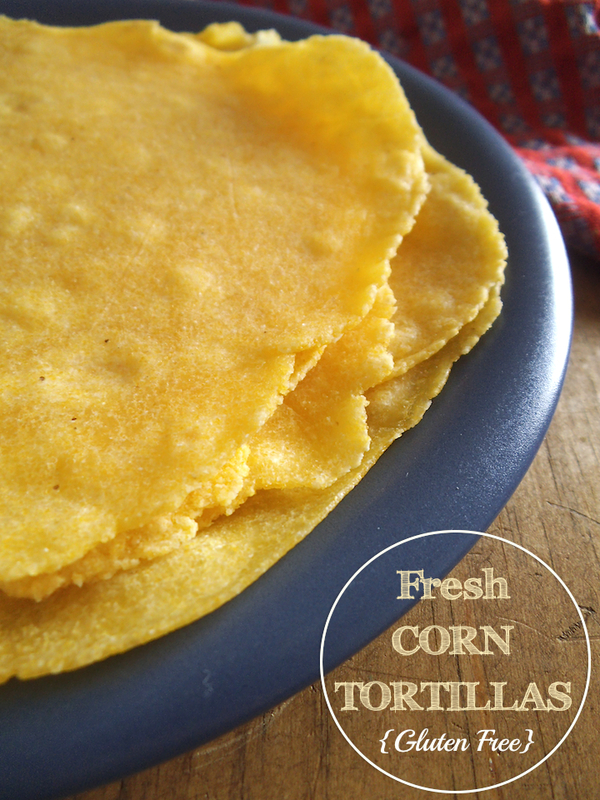 One of the recipes for corn tortillas was even gluten free and featured helpful step-by-step photos here. One reason why it took so long for me to try making corn tortillas is that I thought I needed a tortilla press. But this recipe proves that is not true at all! I rolled each tortilla out between sheets of baking parchment, and the process was even quicker than rolling out flour tortillas. Adding some finely ground flax seed helped the dough stay together fairly well. All in all, these corn tortillas were a success, and they will certainly be competing with my flour tortillas recipe whenever I decide to make tortillas from scratch at home. If you’re feeding fewer than four people, I advise halving the recipe below, or you can freeze extra tortillas separated with sheets of parchment. Whisk together dry ingredients with a fork and drop in butter. Add 1 + 1/2 cups boiling water and stir with a fork until a dough forms. Let cool. Form dough into 16 balls, return to bowl and cover with plastic wrap. Chill dough in freezer for about 20 minutes. Preheat a large skillet over medium-high heat. Place one ball of dough between two sheets of baking parchment. Roll until, thin, flat, and somewhat round. Carefully transfer the tortilla to the hot skillet and cook until the first side has light golden spots. Flip and cook the other side. Continue rolling and cooking the remaining tortillas. Serve warm or use in any recipe calling for tortillas. Gluten Free Wednesdays, Savoring Saturdays and here. My husband Loves corn tortillas. Yours look really nicenter and the directions aren’t bad so I can give this a try. Will be back to let you know how it goes. I’d love to know how the tortillas turn out for you. Thanks for stopping to leave a comment! I like corn tortillas and my boyfriend likes flour tortillas. Now I can make mine and buy his, perfect!!! Glad to hear it! 🙂 I like these better than any corn tortillas I’ve bought. Thanks again, Raia! You’re a great hostess. I’ve made my own tortillas before but never gluten free. Thanks for sharing this recipe on Merry Monday. Pinned. They weren’t any more difficult than rolling out cookies! Enjoy! These homemade tortillas look beautiful! I’m going to highlight them at Gluten-Free Wednesdays this week. My daughter in law is gluten free and would like this. I came over to say thank you for liking my Infographic post. Thanks for the follow and for introducing you blog to me. This looks like a very easy and satisfying tortilla recipe which I hope to try soon. My husband is not gluten free, however he liked these! Two thumbs up! I have never tried a similar tortilla to these ones! I will have to try them as they seem mouth-watering! Is it possible to use some other kind of flour? Sorry, the flour ratios are pretty specific in this. You could try using regular wheat flour in place of the rice flour, but the amount would likely need to change.